I want to share with you how my Easter came early this year, before Lent was over. This “Easter Moment” reminded me how God breaks through my fatigue and busy-ness to show me the Paschal Mystery. Jesus Christ is alive! And, because He is, so are we! But what He went through, and continues to go through for love is incredible! We find Him in our simple encounters, giving to others. Members of my Community decided that this year’s Lenten almsgiving should be both communal and practical. We contacted the Ronald McDonald House to see if we could make a meal for the families currently in residence there. The House is actually a two-story quadrangle-shaped building, built in the heart of the business district in downtown Fort Worth, TX. It’s located close to the major medical centers where the children go for their daily treatments. The Center itself is a dream come true for every child who stays there: inner gardens and playgrounds and game rooms, safe, even for those with hemophilia, special sterile quarters for those awaiting bone marrow transplants. Every room has brightly painted walls to spark any child’s imagination, no matter how sick she or he is! Bees and birds, butterflies and blossoms seem alive and well, and sports stars race across the walls and do spectacular feats against unbelievable odds. And, Mom and Dad can live with their child while they undergo treatments. Most of the children we met were terminally ill, getting various last-ditch exhaustive treatments, trying to give them a ‘leg up’ in their fight against their diseases. Their meal, we decided, needed to be both nourishing and enticing, because often, the aggressive chemo treatments rob the children of their appetites, energy and even hope that they’ll get well again. We roasted pork and turkey, whipped up mashed potatoes, made gravy from scratch, cooked green beans and corn, macaroni and cheese and cranberry sauce, then baked scads of homemade cookies, brownies, and added fruits and raw veggies as snacks and finger food for the families living there. When the group came down to the dining room for dinner, their faces lit up with surprise and gratitude. Because of a miscommunication, the families were told there wasn’t a hot meal being offered that night. Yet, there we were with a piping hot supper along with compassion, reverence and respect for how they were holding up so bravely in their pain. Well, anyone who knows me, realizes that I almost lost the gravy ladle hearing her words. God gives us glimpses in this life of the glory to come; and that this heaven which Christ promises, is both delicious and wonderful beyond words! I pray for each of us this spring that we may have a bit of that child’s grit, faith and bravery! She’s certain about the glory that awaits her. Even the daily suffering she experiences has not shaken her trust that she is loved now and on into heaven. May it be so for each of us! Be filled with grace, now that Easter has sprouted up with new life. Sr. Mary Louise Swift entered the Sisters of the Holy Family of Nazareth in 1968. 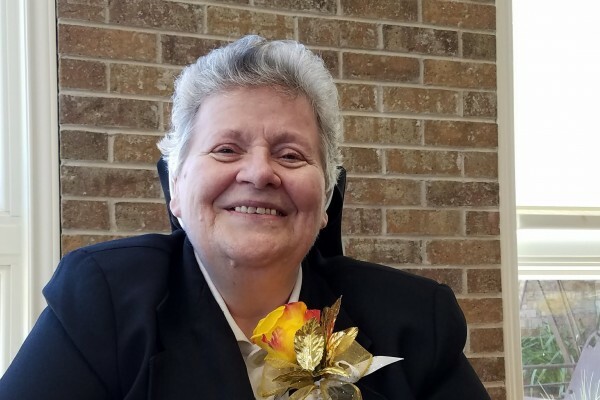 She recently celebrated her Golden Jubilee in Grand Prairie, TX where she serves as program coordinator and spiritual director at Nazareth Retreat Center.